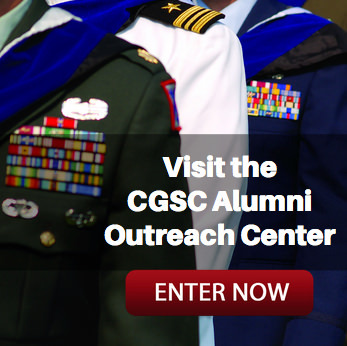 SAMS leads charge in spring NSRT program | Command and General Staff College Foundation, Inc. 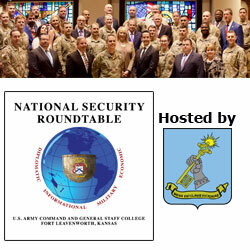 The U.S. Army Command and General Staff College’s School of Advanced Military Studies (SAMS) and the CGSC Foundation cohosted a National Security Roundtable (NSRT) program April 9-10, 2018 at the Lewis and Clark Center on Fort Leavenworth, Kansas. The guests of this spring session of the NSRT program included 17 civilian business, government and academic professionals guests. Several Foundation trustees, former trustees, ambassadors, as well as alumni of the program also attended to provide support. SAMS student escorts linked up with their guests on the first day of the program and moved to the Arnold Conference Room. Foundation President/CEO Roderick M. Cox welcomed the group and had them introduced themselves around the room. Next, Mr. Jeff LaMoe, the Director of Operations and Support for Army University, provided the group with a briefing on the history of the U.S. Army Command and General Staff College and an overview of Army professional education with special emphasis on the College and the SAMS program. After LaMoe’s briefing, Mr. Kevin Rousseau, the CGSC Distinguished Chair for National Intelligence Studies, delivered an unclassified world overview briefing to set the stage for their understanding of national security issues they would discuss on day two. The first day ended with a reception in the atrium of the Lewis and Clark Center. On the morning of day two of the program, Col. Kirk Dorr, director of SAMS, and Dr. Scott Gorman, deputy director for academics, gave the NSRT attendees an inside look at the SAMS mission and curriculum. After the orientation and a few questions, the NSRT guests accompanied their student escorts to their classrooms to participate in regularly scheduled classes with all the other SAMS students in their small group seminars. Their discussions for the morning were focused on “Anticipating the Future – Nuclear Weapons.” They remained in the classrooms for two hours, and then reconvened back at the Lewis and Clark Center for a group photo, lunch and panel discussions. 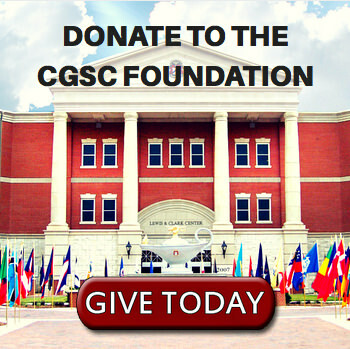 During lunch Cox provided the group with an information briefing on the CGSC Foundation’s mission and programs. The afternoon panel discussions were moderated by SAMS faculty members and presented by SAMS students. Panel 1: Emerging Technology and Artificial Intelligence – Future Wars, presented by Maj. Daniel Harrion and Maj. Douglas Stansbury and moderated by Dr. Dan G. Cox. Panel 2: Large Scale Combat Operations, presented by Lt. Col. Dominik Schellenberger (German Army) and Maj. Zach Morris, and moderated by Dr. Philip Hultquist. Panel 3: Strategic Challenges Posed by China, presented by Cmdr. Jacob Rosales (U.S. Navy) and Maj. Nicholas Yetman, and moderated by Dr. Barry M. Stentiford. After the panel discussions, Col. Dorr and Foundation Chair Michael Hockley presented each of the attendees with an NSRT completion certificate with a copy of the group photo and a Foundation challenge coin. The Foundation extends special thanks to Col. Dorr and his staff – Mr. Rich Dixon, Dr. Scott Gorman, and Lt. Col. Terry Robinson – along with the SAMS student volunteers for their work in coordinating and hosting this spring NSRT program. Special thanks also are due to the sponsors – CGSC Foundation Trustee Terry Lillis, Geiger Ready Mix, and the Perot Foundation. Their support makes this program possible. 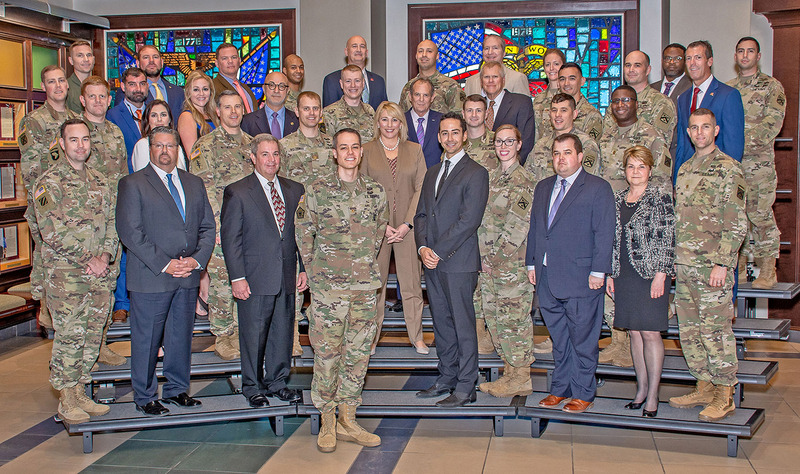 The National Security Roundtable Program is cohosted by CGSC and the CGSC Foundation to foster mutual understanding between the business community, the U.S. Army and the Command and General Staff College. Contact the Foundation for more information.